722 Montgomery Street It's fitting that the Montgomery Street office building of Melvin Belli, the King of Torts, is mired in a seemingly unending morass of lawsuits brought by Belli's survivors, former business associates, neighbors, and the City. The flamboyant and influential Belli was a pivotal figure in today's litigious society as an innovator in the area of personal injury law. He took on big corporations and controversial clients. Belli's clients included Errol Flynn, Jim and Tammy Faye Baker, Lana Turner, Mae West, Muhammad Ali, and Jack Ruby. The Gold Rush era building at 722 Montgomery Street is a historical landmark and the offices where the renowned attorney held court. Eventually reduced to a ramshackle, the offices were once a monument to Belli's $60 million success. Belli died in 1996 at the age of 88, just a few months after filing for bankruptcy. Parties involved in acrimony over the landmark property and/or a fortune in unfinished legal cases include Belli's son Melvin Caesar Belli, the senior Belli's wife of three months Nancy Ho Belli, the City's Building Inspection Department, and others. 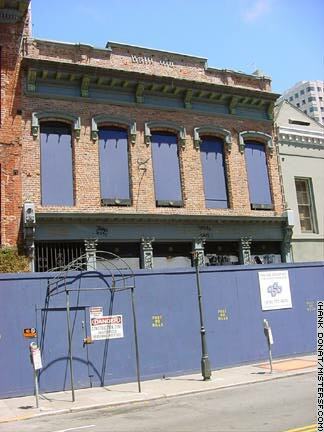 Particularly galling to San Franciscans is the fact that Mrs. Belli, who announced the ground breaking for a Belli museum on the site in 1997, sat on the San Francisco Landmarks Preservation Advisory Board while she allowed the Belli building fall into ruin.